Cyberview Sdn Bhd was honoured with the Movers & Shakers Award from the 2018 Asia HRD Awards for championing efforts in transforming the workplace culture at Cyberview. 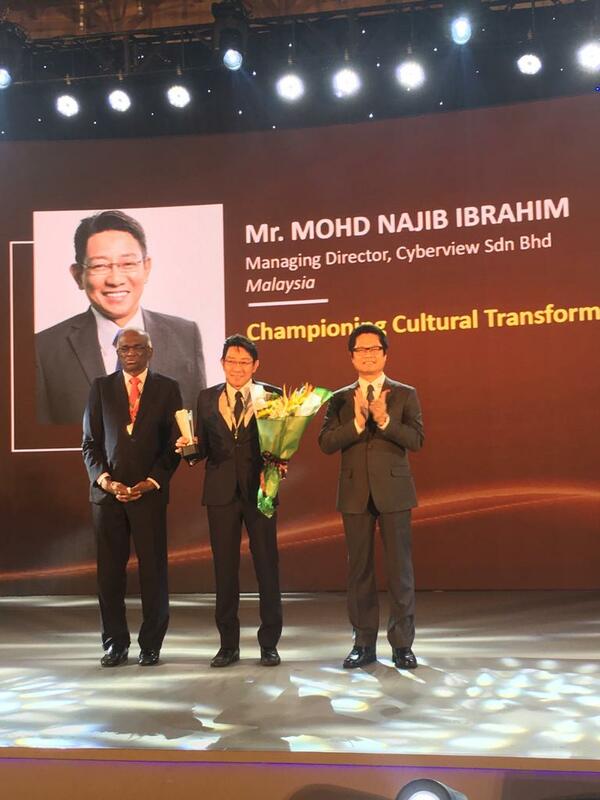 The award recognises its managing director, Mohd Najib Ibrahim for his outstanding work towards transforming Cyberview as a high-performance organisation. He received the award at the prestigious annual event held in Ho Chi Minh City, Vietnam. The Movers and Shakers Award is presented to individuals who have demonstrated accomplishments by actively influencing changes and breakthroughs in people development. They are responsible in making a difference in their communities, leading high-performing teams to spur business growth, and drive employee engagement in their organisations. These individuals are evaluated based on the following criteria: impact and influence; innovation; credibility; pioneering and championing transformational activities. “We are honoured to receive this prestigious award as it acknowledges our continuous efforts in building a collaborative innovation ecosystem for the benefit of start-ups and citizens. Our achievements at Cyberview are attributed to the people, workforce and our working culture, which is why our Culture Transformation initiative is important to us. The initiative was designed to achieve greater internal and external improvements to the organisation towards our goal of becoming a High-Performance Organisation,” said Mohd Najib Ibrahim, the Managing Director of Cyberview Sdn Bhd. Inspired by leading tech giants, Cyberview provides its employees with a working space option that presents an informal atmosphere to allow them to unwind and relax during and at the end of the work day. The space serves to cultivate a friendly, engaging atmosphere where employees can gather to brainstorm innovative ideas. The company also has an on-site Childcare Centre that promotes a family-friendly environment. Other amenities include a nursing room for new mothers, games/gym area as well as a mini library that that serves as a source of knowledge for employees. “At Cyberview, we strive to meet the criteria of a high-performance organisation – one that achieves a sustained growth, contributes to continuous improvements on our core capabilities, allows adaptability and long-term orientation of the company. We aim to continuously cultivate an open, high-performance workplace culture guided by three core values – honesty, integrity and passion that sees active employee engagements, the development of a compelling employer brand and effective leadership,” he added. In September this year, the Tech Hub Enabler was also the recipient of the Best Project Award for Development from the prestigious 2018 Malaysian Construction Industry Excellence Awards (MCIEA), organised by the Construction Industry Development Board (CIDB). The award serves to recognise individuals and organisation that have contributed to the performance and improvements in the construction industry. Cyberview was recognised for its outstanding efforts in the construction of Masjid Raja Haji Fisabilillah in Cyberjaya, the first mosque in Malaysia with a Platinum Rating – the highest classification for Green Buildings under the Green Building Index. Built using environmentally-friendly materials, the mosque is equipped with light sensors, a water harvesting system and over 800 solar panels that can generate enough electricity to power up the 41 hectares site. This is the third consecutive award won by Cyberview from the Asia HRD Awards, an independent initiative that welcomes nominations throughout the year from Asia and around the globe.